Astell & Kern partners with Beyerdynamic for T5p 2nd-gen headphones | What Hi-Fi? As with its AK T1p and T8iE Mk II headphones, Astell & Kern’s latest over-ear headphones, the AK T5p 2nd Generation, have been manufactured by Beyerdynamic and tuned for the brand’s portable music players. Unsurprisingly, then, the AK T5p (2nd gen) utilise the Beyerdynamic Tesla transducers found in the Beyerdynamic versions. The supplied detachable cable has been specifically designed for the A&Ks, though. Made of four silver and four copper cables braided together, the cable is terminated with a 2.5mm 4-pole balanced connector to match the balanced headphone output on Astell&Kern players. Using a source without that connection? Both 6.3mm and 2.5mm-to-3.5mm adapters also come in the box next to a carry case. 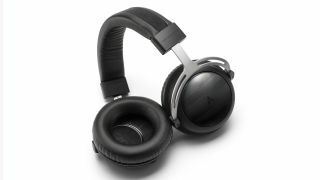 Only 1000 of the AK T5p 2nd-gen headphones will be produced, and they’re on sale now for $1,199.